Rumbavana was founded in 1956 as a traditional conjunto best remembered for the voices of Raúl Planas and Orestes Macias, but it wasn't until 1967 that its most important creative contributor , pianist Joseíto González, began his 20 year tenure. 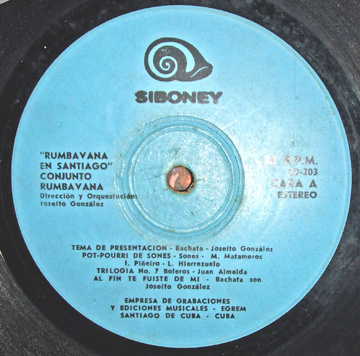 During the 70s, the band recorded for EGREM's Havana-based label Areíto, but the albums that were most relevant to the "roots of timba" were done in Santiago in the 80s for Siboney. Joseíto left in the late 80s and there's a current incarnation led by Michel Calvo.